For the fourth year, the Sunday Times today publishes the â€˜Food Listâ€™ â€“ the top 100 UK restaurants for food. This supplement is published in association with Hardenâ€™s, and based on the Hardenâ€™s annual survey of restaurant-goers. 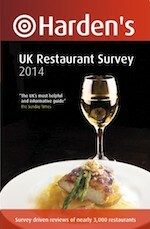 For 2014, the survey crowns Michael Caines restaurant at Gidleigh Park in Devon as the home of the UKâ€™s best cooking. Second is last yearâ€™s winner, Andrew Fairlie at Gleneagles, and third is The Yorke Arms at Ramsgate-n-Nitherdale, North Yorkshire. The full list is below, with chapter and verse published in todayâ€™s Sunday Times. A shame once again Northern Ireland is missed out. We have at least 3 restaurants deserving of this list in, Ox in Belfast, The Boathouse in Bangor, and Balloo House in Killinchy. With others to watch out for like Will Brown's Old School House Inn in Comber.